According to Leonardi DiCaprio and Al Gore the 2007 Academy Awards ceremony was carbon neutral - carbon offsets purchased by the Academy from the Natural Resources Defense Council (NRDC). The Academy reportedly purchased 178 megawatt hours of electricity offsets (emission free production of electricity that substitutes for hydrocarbon produced electricity). 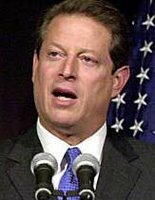 Of course, the film tha Al Gore narrated, "An Inconvenient Truth" received the Oscar for Best Documentary. Of course, advertising the problem does nothing to reduce it.